I am attempting to determine the age of a stone Buddha head. 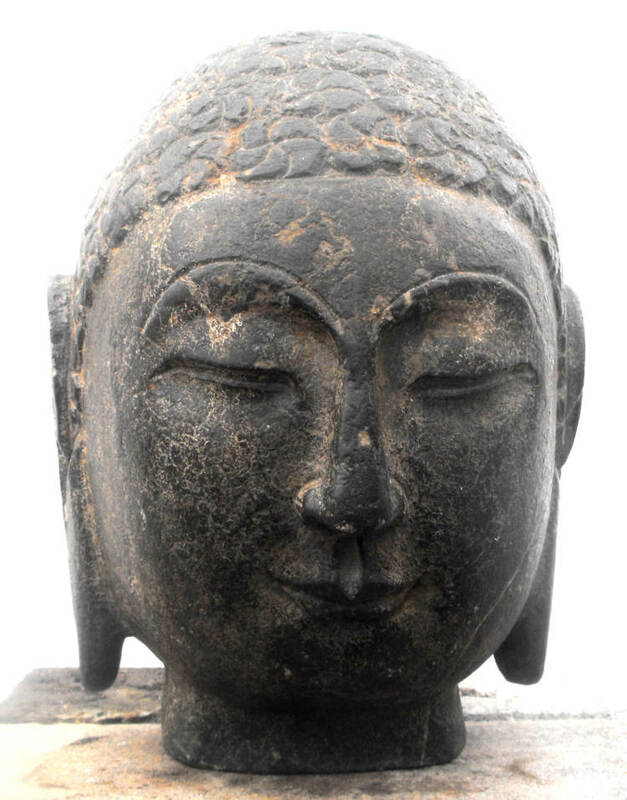 it is a full size, dark gray limestone sculpture of the head of a Buddha. I believe it to be from Sui dynasty. I believe it is very similar in quality to museum pieces I have seen. The sculpture is finely carved. The face of the Buddha is very classical in its regular features, its slender nose, beautiful curving eyes, that are partially opened and downward looking; it has full lips, a defined clift and large incised brows. The Buddha contains the distinguishing feature of the Sui sculptural style in the treatment of the ushnisha. Due to the sophistication of the sculpture, the presence of the ushnisha is almost not visual, but can be clearly felt. The hair is treated as a series of flat large incised five segmented spiral “bumps”. The ears are large pendulum shapes with no indication of adornment to the lopes. Base of the skull as it forms into the neck contains an indentation. Under 100x magnification the Buddha head was covered with “golden gilding”. (see photo below) There appears to be no other pigmented coating on the sculpture. The dimensions of sculpture is 9.5” (24.1 cm) height by 6.5” (16.5 cm) wide by 7” (17.8 cm) depth. Using XRD (powder) analysis of material sampled in the “cut” face of the sculpture, showed that the stone consisted of calcite (see attached) as the dominant mineral, with a density of 2.73 and absorption of 0.2 % as though the stone was “sealed”. There was also a trace presence of uramarsite (currently found in eastern Kazakhstan and south central Mongolia). The surface material I on the “cut” face was also analysed, it contained a combination off ankerite, dolomite and graphite. Ankerite and dolomite may be present in the ”loose” gold found in central and eastern China and the “graphite” could be residue from a coal tar based primer. I am attempting to obtain XRF analysis of the surface, to further understand the “gilding” and binder system. Though the sculpture contains a sedimentary lens, there are no “cracks”, opening or repairs evident. The “lower” face appears to be “weak”. This may be reflective of a Buddha that was designed to be “looked” up to. From a lower visual point, the Buddha appears “fullier”. In a subjective way, the Buddha is almost appears feminine. This is why I believe it is from the Sui dynasty. The quality of the lower rear surface off the sculpture is not as refined as the the frontal area as though implying this sculpture may have been against a wall. There is also evidence of parallel “cuts lines” (chisel marks) in the rear of sculpture. There are no circular cut or abrasion patterns, other than the ones on the cut surface. The head of the Buddha appears to have been detached from the body using a circular abrasion cutter and “snapped” towards the end of the cut which resulted in the head to fall, which in turn, could have been the genesis of the small break at the top edge of the left ear. The prominence is that the sculpture was purchased by my deceased father-in-law for his wife as a gift from an “antique” store in Springfield, MA., USA, in the late seventies and has remained in their family since then. I am not an art dealer, or someone involved in that industry. I am retired engineer who came upon this sculpture while moving my mother-in-law to my house for care. Over the past several years I have researched the sculpture artist design characteristics and the materials incorporated, mainly through the internet and books. I have discussed the sculpture with many individuals from both academia and the art industry. As my research progressed, i began to further appreciate the sculpture’s beauty and execution, its origin and history, and enormous amount of work that was needed and the skills of the craftsmen. I am not Buddhist not I am Chinese, I can only relate to this sculpture through my own culture. Through my research, I began to see it's creation, but I also began to see It's destruction. The stone required for this Buddha must have weighed well over a ton and was cut by hand from a quarry face.. The stone was then moved (dragged) to the temple location, then expertly carved and polished. The finished sculpture was then coated with a thin coat of hot coal tar (graphite) gesso and “gold” flakes were adhered to the surface. The “gilding” was not done with a gold leaf or a “refined” gold. The gilding was crushed and sieved “loose” gold (containing ankerite and dolomite) flakes applied directly to the hot coal tar binder. I believe the Buddha was not decapitated for it's head, but for gold that coated it. This was not for the archaeological value, but for the gold. The remnants of that “stripped gold” can found on the cut face. The sculpture was gilded at the time it was “cut”, as it had been for almost 1500 years. The decapitated head was cut with an ~ 6” circular abrasion saw, snapped, allowed to fall to the ground, resulting in the fracture to the top of one of the ears. The detached head, most likely with many others were then taken somewhere else and stripped of its gold. I believe the stripping was done through the use of a solvent, there is no evidence of an abrasion wheel or a torch. After the gold was removed, the head was discarded. I believe Chinese immigrants who migrated to America in the late 70s bought the sculpture with them. I am looking to sell the sculpture, either directly or through auction. I would honored to be part of its journey home to China. The Buddha has a sense of presence and of beauty. It is both enjoyable to look at and to touch. It is very feminine. Thank-you for your time. The sculpture is located near Boston, Massachusetts USA. The Sculpture has been in private holding in the USA since approximately 1980.